It is a brick-built Temple of Navaratna-type with a square lower storey and nine curvilinear towers with one central tower and four corner towers on two lower levels. The façade of the temple is decorated with carved bricks representing the ten incarnations of Vishnu and scenes from the Ramayana. It is dated to c.1683 AD. 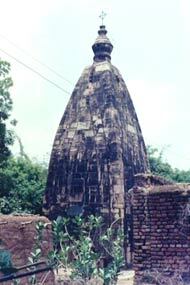 It is a plain stone temple with sharp corners and a tapering sikhara. 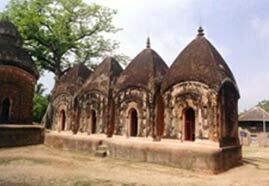 It has two inscriptions in Bengali fixed above its entrance on east and from them we get its date of construction in 1643 AD. These two mounds located to the north of the village next to the railway track towards east are said to be the remains of a King's palace and the remains of a Siva temple. Both are dated to c.10th-11th century AD. 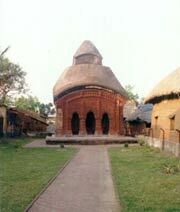 The village is famous as the birth place of Chandidas, the famous poet. 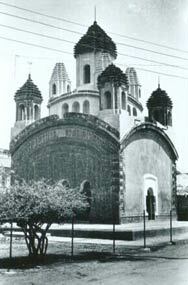 The mound is full of brick-bats and brick-built Temples. The bigger Temples are of no interest, amongst the smaller ones (c.17th-18th century AD), four have plaster decorations and two ornamental brick facing. The mound called "Chandidasas's Bhita", was excavated by the university of Calcutta in 1945-46 but nothing important was found. The mound is datable to c. 14th century AD and the Temples are of c. 18th century AD. Excavation has been conducted at the mound by the Archaeological Survey of India (Eastern Circle) in 1964. This is a brick Temple with well executed terracotta carvings representing various members of the Hindu pantheon. It consists of a small garbhagriha and a three-entranced corridor. It is datable to c.18th century AD.